The reason why to win on corners or cards betting markets is easier than on main ones. Home Articles The reason why to win on corners or cards betting markets is easier than on main ones. Last time lots of bettors began to understand that getting profit on big markets became harder and harder at bookmakers. Bettors draw attention on bets that are less popular but which are as well flexible for statistical analysis and prognosis. 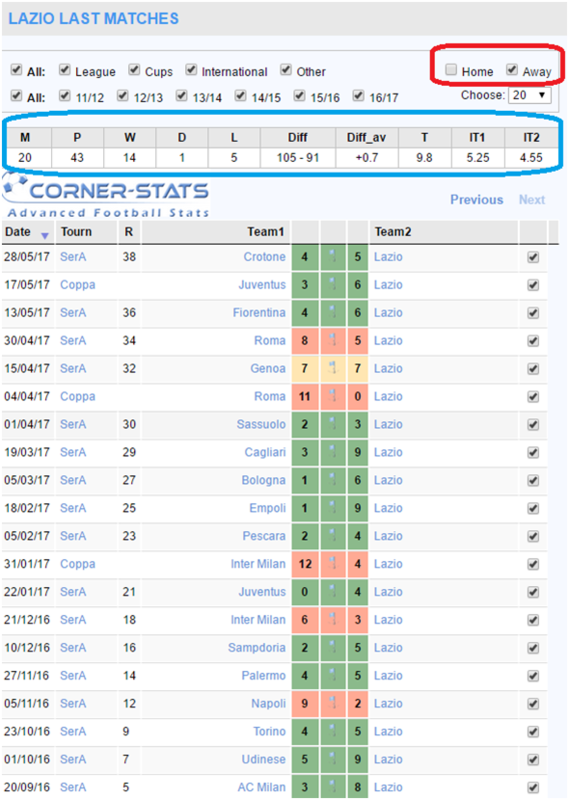 The team of service of advanced football statsCorner-stats.com offers to look on small markets of corners and cards, because bookmakers actively started to propose bets on these markets accordingly. Markets on cards and corners are extremely attractive to win for bettors. As a rule, betting on corners consists of the same choices as main markets on goals (except from the correct score on corners in the match, which is replaced by some bookmakers on range of corners). 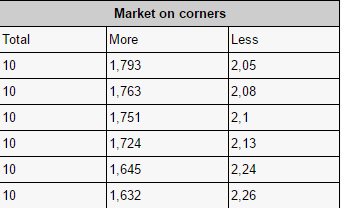 For top leagues and top matches betting lines on corners is more complete and contains many events. In leagues of the second or lower divisions bookmakers usually offer a narrow variety of corner markets. In a similar manner to a pre-match line, bookmakers also offer markets of corners and cards to bet in-play. 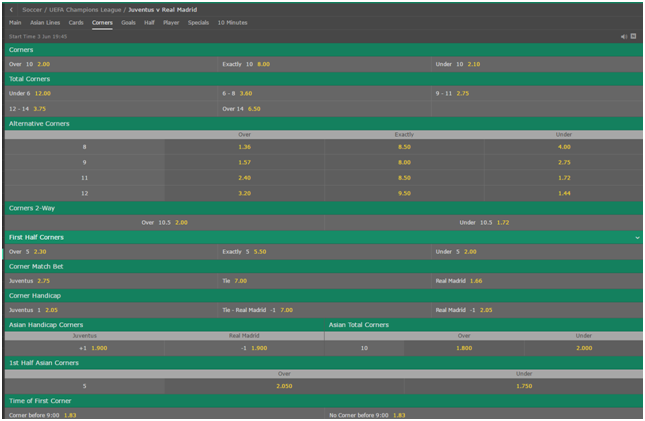 We want to note that in-play some bookmakers, for example, Bet365, offer to bet on the market Race to X corners, і.е. which of the teams will firstly have 3/5/7/9 corners. That is, the player has the opportunity to bet on corners of a particular team, rather than total of the match. Usually, you won’t find this bet in the pre-match line. One of the main advantages of a bettor in betting on corners or cards is difficulty for the bookmaker to estimate correctly the probabilities and calculate the odds, because many factors must be taken into account. Nowadays bookmakers use basically software that automatically draws a line on corners and cards based on average teams’ stats numbers in previous matches. Therefore, if a bettor has the opportunity to analyze other important parameters that effect on corners or cards, he will be able to get an advantage over the bookmaker and be in the black. Agree that in case that one team is stronger than the second one, it’s not a fact that it will take more corners. After all, you can win a match even not taking a corner in the match, while the opponent side can take a lot of corners, but the goal will not take place. It is also difficult for the bookmaker to predict match scenarios, especially before it starts. Because match scenarios often depend on the first goal at principal meetings. The opponents can take the match slow mostly playing in the center of the field while the whole match can go as well. So from where corners appear? But after the first goal the picture can change dramatically, because the loosing team needs to score and the whole team can go on the attack (especially at the end of the match).Therefore, one corner goes smoothly into the series, when after the banding the ball and relegation of the ball from the penalty area, there is a long-range strike on the target with a deflection on corner. The absolute value of the correlation ratio below 3% indicates that the relation between the number of goals in a match and the number of corners in a match is negligible (so that we can talk about some relation between the two indicators, the absolute value of the correlation ratio should be at least 30%). The same statement for cards: the ratio is also negligible between the number of goals in a match and the number of cards. Apart from, the principal amounts of bets are placed on the big markets and to control the change there is more important. But on corners and cards – sums of bets are smaller. That is, if the bookmaker made a mistake in the calculations, then on the big market sit will be quickly fixed, but it can hang up on the corners (cards) markets to the beginning of the match. Thus taking into account that bookmakers pay less attention to corners and cards markets, making the calculation of odds by "algorithms", can increases the chances of winning there. As is already noted above, bookmakers mainly take into account the average number of corners or cards of teams in previous matches when drawing lines for corners and cards. Consider in detail other important factors that effect on the quantity of corners and cards and which are likely not taken into account by bookmakers. Obviously, if there is a team of higher level of skills, it will actively attack and take more corners. We won’t analyze this factor in details, since we believe that it has already been counted in bookmaker odds. But other factors should be looked on carefully. At home, as a rule, the team plays to win and attacks throughout the match, despite the score because this is required by the fans. 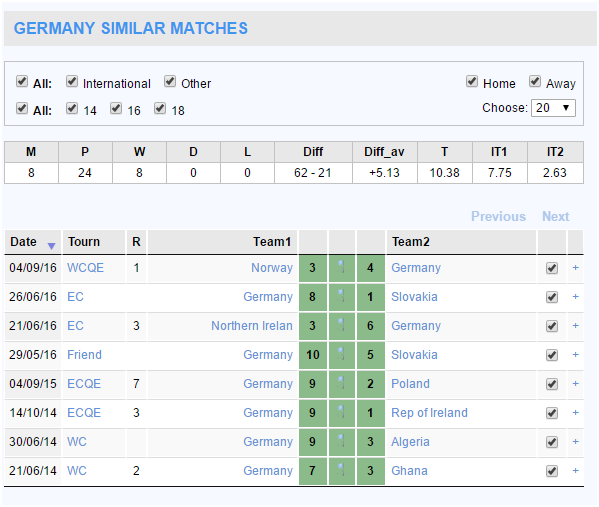 During the season the team plays many matches with different opponents in strength. Accordingly, the manner of play of a team with a strong opponent and with a weak one will be different. If Chelsea plays with another leader (Manchester City, for example), then, probably, its statistics with the outsider teams won’t be very useful for us, but the statistics of Chelsea in matches with other top teams would be very welcome. If one of the teams has huge motivation to win, then the situation is very likely that the team will have to attack a lot, which increases the chances for corners or series of corners. Also, if the confrontation between rivals has a long history, and the fans of both clubs are irreconcilable - then the fight on the field will be tougher than usual, which often leads to the situation when the losing team will make the last assault at the end of the match (the chances of corners increase). Having studied these factors and determined the team with increased motivation, you can play well at the market "Race to X corners" in-play. Pay attention on the indicator "how much time on average for the match the team owns the ball." After all, the more time a team owns the ball, the less the opponent does, and the less the last team has a chance to give a lot of corners. 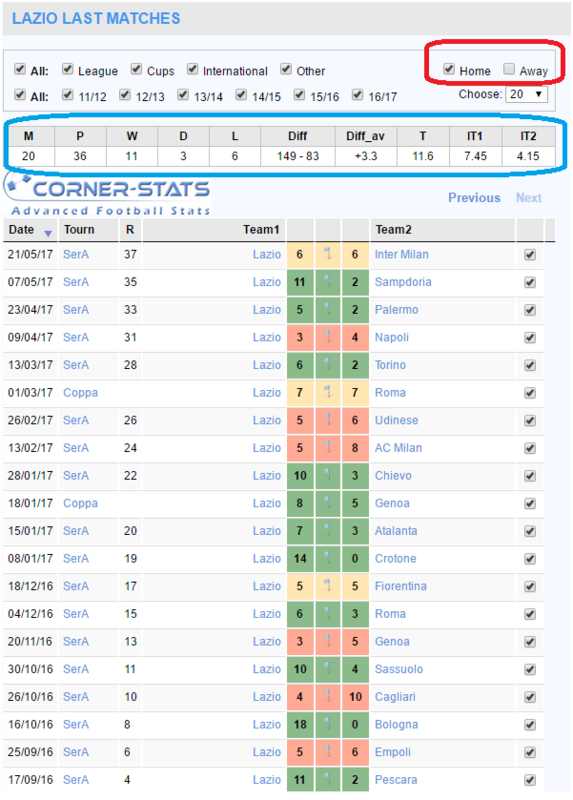 Analyze the statistics of possession of the ball in the context of personal(H2H), last and similar matches using the service Corner-stats.com (tab "Other" - additional statistical indicators). Be acquainted with team squads before the match. If one of the teams has problems with one of the defenders, teammates may not play harmoniously in the match, creating more dangerous moments near their gates (probability of corners increases). The team of serviceCorner-stats.com works on functional that will determine the optimality of a team’s squad and will soon provide it for analysis. If at the moment of the match started to rain or the field is viscous, players often make mistakes, thereby knocking the ball out of the field, which increases probability of corners. 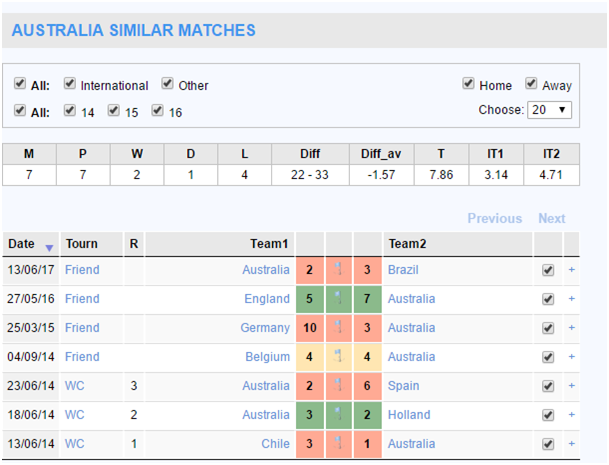 Information about the weather on match day is displayed on the "Info" tab for a specific match and appeared recently. In addition, this information has a great impact on games where stadiums are not high-level standards of quality, that’s why it should be paid attention in matches from the lower divisions.